Dredge pump selection can be a challenging task, lets try to simplify the process. Dredge pump or slurry pump selection could be a challenging process which could be simplified with the understanding of the primary factors behind smooth pump operation. Apart from delivering a more efficient performance, the right dredge pump requires lesser maintenance, reduced power and has a relatively longer life. Slurry pump and dredge pump terms may be used interchangeably. Slurry pumps are the mechanical devices utilized for pressure-driven transport of a fluid mixture (aka slurry). The fluid mixture by and large consists of water as a liquid with solids being minerals, sand, gravel, human waste, drilling mud or most of the crushed materials. Dredge pumps are a special category of heavy duty slurry pumps that are utilized in the process of dredging. Dredging is referred to as the process of transport of underwater sediments (usually sand, gravel or rocks) from one region to another (a typical dredging equipment is shown in Figure 1). Dredging takes place in shallow water areas of lakes, rivers or ocean for the purpose of land reclamation, desilting, flood prevention, creation of new ports or expansion of existing ports. Hence, various industries which utilize dredge pumps are construction industry, mining industry, coal industry and oil & gas industry. Apart from economic considerations, two primary selection considerations for dredge pump operation are no settlement of sediments in the pump and minimum amount of wear and tear in the pump due to the flow operation. The key design parameters to keep in mind to satisfy the primary requirements are the type of installation, critical flow rate, total discharge head, and the pump design material. Before moving on to estimating the design parameters of ‘your’ slurry pump, an extremely crucial step is being familiar with the material that needs to be transported. Therefore, estimation of pH and temperature of the slurry, the specific gravity of slurry and concentration of solids in the slurry is the first crucial step towards the direction of ‘your’ ideal pump selection. Critical flow rate is the transition flow rate between a laminar and a turbulent flow and is calculated based on grain diameter (size of slurry particles), the concentration of solids in the slurry and the pipe diameter. For minimal settlement of sediments, the actual pump flow rate of ‘your’ pump should be higher than the calculated critical flow rate for your application. However, it is important to be careful with the selection of the pump flow rate as the increase in flow rate will increase the wear and tear or abrasion of the pump material and hence reduce the lifetime of the pump. Hence, for an uninterrupted performance and extended lifetime, the pump flow rate should be optimized. Total discharge head is a combination of static head (actual elevation difference between the surface of the slurry source and the discharge) and friction loss in the pump. Along with dependence on the geometry of the pump (pipe length, valves or bends), friction loss is also affected by the pipe roughness, flow rate and slurry concentration (or percentage of solids in the mixture). The friction losses increase with the increase in pipe length, the specific gravity of the slurry, concentration of the slurry or the slurry flow rate. The pump selection procedure requires that discharge head of ‘your’ pump is higher than the calculated total discharge head. On the other hand, it is crucial to note that the discharge head should be kept as low as possible to reduce the pump abrasion due to slurry flow. What is the density of the material? What is the viscosity of the material? What you should know about your project. 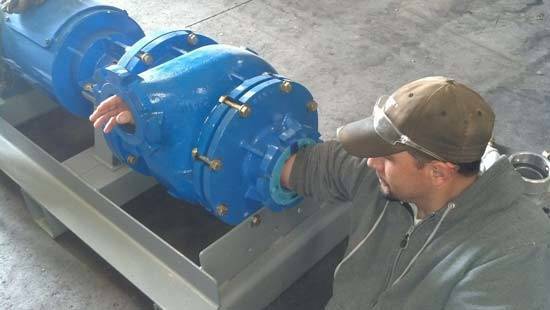 These items are important in determining the proper EDDY Pump for your project. Hopefully, any company you get a quote from is asking these questions. This is especially important in the pumping of sludge, slurry, muck, mud and other viscous materials. Call us for a consultation. The power consumption by the dredge pump is estimated from the discharge head, flow rate and specific gravity of pumped slurry. It is critical to verify that power rating of the selected pump is higher than the calculated power consumption after taking into account reasonable variations in operating conditions. Typical material used for the construction of slurry pumps are cast iron, stainless steel, and high chrome steel. Some slurry pumps come with a lining to better deal with problems of slurry abrasion. A few elastomers which are used in the lining material are natural rubber, polyurethane or neoprene. The selection of lining material depends on the operating temperature, pH of slurry and the presence of specific abrasive fluids used in the dredging process. Based on the shaft orientation, the slurry pumps can be divided as horizontal pumps and vertical pumps with horizontal pumps having the shaft in a horizontal position while the vertical pumps have a vertically aligned shaft. Horizontal pumps are the most common types of slurry pumps used, and hence have the advantage of ease of installation or maintenance, a wide range of selection of flow parameters and choice of design materials. However, the vertical pumps among other benefits have the advantage of requiring relatively much lesser ground space for installation. Another method to classify the type of installation for slurry pumps is dry installation or wet installation. Dry installation pumps have the hydraulic end and the drive located outside the liquid while the wet installation pumps such as submersible pumps operate inside the sump or the slurry. The submersible pumps do not require much support structure, hence, do not occupy much space. 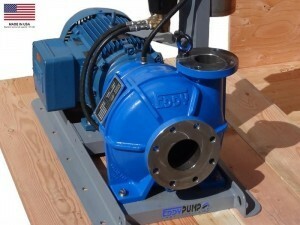 Depending on the kind of operation and installation desired the preferred method of pump installation is decided. Due to an extremely varied grain size distribution of materials handled by dredge pumps clogging of the suction or discharge of the pumps is a damaging phenomenon which leads to expensive maintenance procedures and more importantly high downtime. Our patented technology at EDDY pump has a high tolerance of sizes of materials handled, with a capacity to handle sizes as large as 9 inches. The open rotor design lets anything which can go through the inlet pass through the discharge without any setbacks. A typical high tolerance dredge pump manufactured at EDDY Pumps is shown in Figure 2. Figure 2: A high tolerance EDDY Pump. 3-inch Pump Designed For Non-Clogging and Heavy Slurry. Call for details. Massively abrasive nature of slurry’s solid particles causes an enormous amount of wear and tear in pumps. 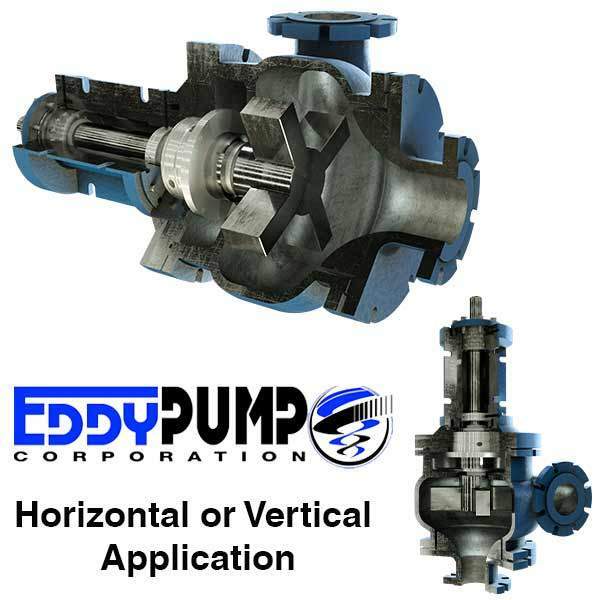 Due to the harsh environments in which slurry pumps operate, EDDY pump gives utmost importance to use the finest material for the impeller, seal, and casing to prolong the lifetime of the pump. Hopefully, you have a better understanding of the elements needed for proper pump selection. Even better is talking with us to help with your project specific needs. View our videos, pump page and explore the site. 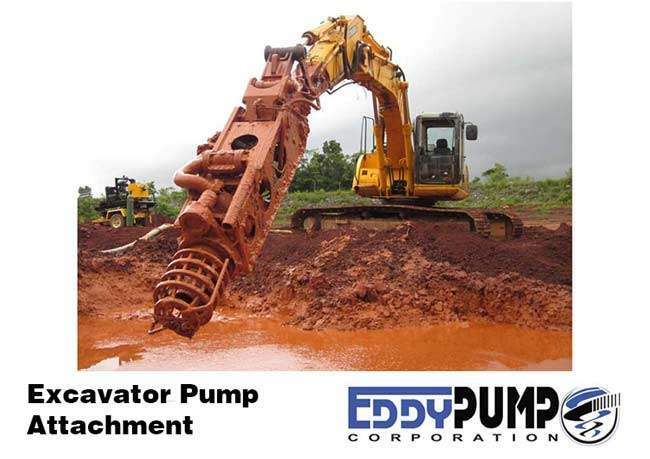 At EDDY Pump we are committed to providing best-in-class dredge pumps to our customers; hence, each component is thoroughly tested to deliver supreme quality, reliability and versatility. Our unique technology provides us with an extraordinary capability to easily handle materials with enormous volumes and high specific gravity in tough conditions. This video shows how EDDY Pump transports high slurry and abrasive materials. Featured dredge pump equipment includes the Remote Operated Subdredge, Diver Operated Pump and an Excavator Attachment Dredge Pump. Fully assembled 4-inch pump has clearance to pass an adults arm. 1-9 Inch clearance options.